This is a great thing since we have a very large family with lots of stuff. Wish you could sell the labeling tape separately. Or give reference as to where to purchase it. Lastly it would be great if the stamps and all accessories came in a larger font. Purchased to make my mother's clothing. She is in a memory care unit and the facility does her laundry. Set up of the print type was fairly easy and the print itself is clean and very legible. I like its versatility, too. Great product! My mom is in a nursing home and everything has to have her name. This will make my life so much easier than having to wait for the nursing home staff to label things. Love the ink stamper, brought to label my grand mother clothes cause she's in a nursing home. Ink is nice and bold and good size lettering. Only gripe is that it takes a while to place the letters on the stamper, but once you get the hang of it, it gets easier. Happy with purchase. My girls are notorious for leaving their sweaters and hoodies anywhere and everywhere. It drives me crazy to have to replace really nice stuff! I bought cute iron-on tags last year but they started to peel off within a few months. This stamp is so much better. Though the letters are quite little*, they're still readable. To be honest, I mostly care that it's THERE so that it can always be identified as ours if need be in a "I think she's wearing my sweater" moment. This is a great stamp that is easily personalizable. I use this to label my son's clothes and other items so they don't get mixed in with other kids' belongings at day care. The ink has lasted even after putting my son's clothes in the wash. Really happy with this! We love this product! My kids stamp every article of clothing we have. We bought two so each could have their own (rather than changing out the letters each time). We haven't washed yet but unless something awful happens after a wash, we are sold! The font is also really lovely. Recommend highly. Works as promised. It is great to be able to put my information on anything I want. Wonderful. Does not come off in the wash. 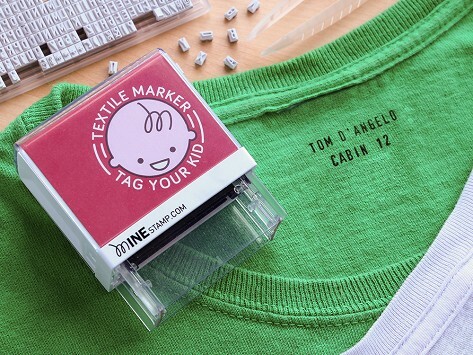 When you were a kid, your mom may have sewn those custom clothing labels into shirts and bags for school or camp. Or, to save a little time, she may have used a laundry marker. Which means, ID-ing your things either took a lot of time, or didn't look very good. Paco Navaez, a father of three, uses Minestamp, and not just because he came up with it. With Paco's invention, labeling anything from books to uniforms to backpacks is as simple as one press. The resulting ID stamp is clean and clearly legible, using wash-resistant textile ink. Each Minestamp is yours to personalize, with a set of letters and numbers included and a pair of tweezers to help you set them. With up to three lines of text, add name, address, and phone number or email. More than one child? Simply change the letters for different names. Or, you can save time and just pick up one Minestamp for each kid. Slide a photo or illustration inside the handle of each Minestamp as a fun way to keep them sorted.